When people think about Japanese beer, they usually think of mass produced brands such as Kirin Ichiban or Asahi Super Dry. They probably don’t know that there’s a burgeoning industry of craft breweries in Japan that make a wide variety of good tasting beers. So I’ve decided to launch a series of posts exploring craft beer and craft beer restaurants in Tokyo. Up until 20 years ago, Japanese law required that beer makers had to produce at least 2 million liters (about 528,000 gallons) per year in order to be eligible for a brewing license. This meant that the market was dominated by an oligopoly of major companies including Kirin, Asahi, Sapporo, and Suntory. It also meant that Japanese beer was pretty much limited to pilsner-style lager beers that are certainly better than the macrobrewed beer you find in many other countries (I’m looking at folks like you Budweiser and Miller), but are nonetheless prosaic and rather boring. People generally did not know about ales and other types of beer. But in 1994, the Japanese government changed the laws to allow for companies that brew a minimum of 60,000 liters (about 16,000 gallons) per year. This opened the door to the development of the Japanese craft beer industry, with micro breweries popping up across the country making various kinds of beer. One of the most prominent Japanese craft breweries is Yoho Brewing Company based in Nagano prefecture, which is famous for its award winning American-style Yona Yona Ale. The ale, which I first tried many months ago at an outdoor festival, was inspired by Sierra Nevada’s famous pale ale but has a milder, more citrusy flavor than its U.S. counterpart. You can find Yona Yona Ale and other Yoho beers at craft beer bars throughout Tokyo and at certain supermarkets, including the food section of the huge Muji store in Yurakucho. 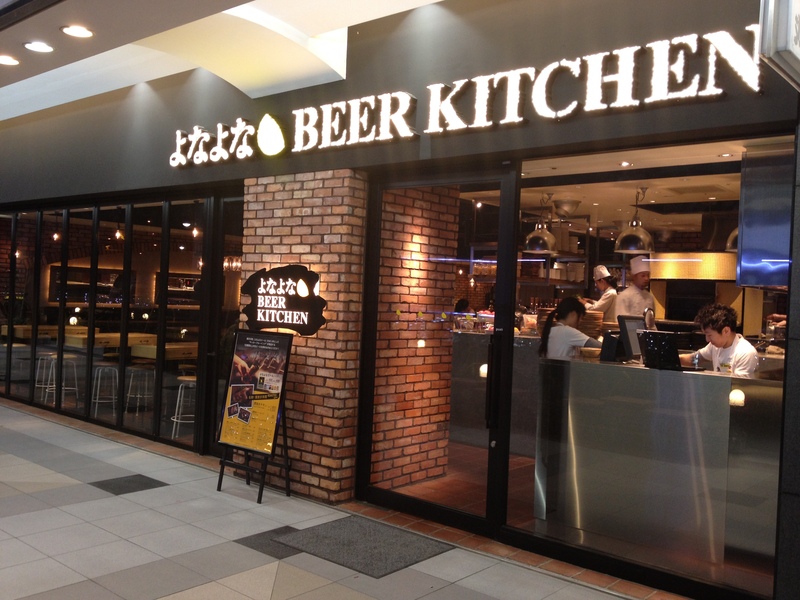 Late last year, Yoho opened its first ever craft beer restaurant called Yona Yona Beer Kitchen, located on the border between the districts of Akasaka and Nagatacho, and just a stone’s throw away from the Prime Minister’s residence and the Japanese Diet (national legislature). Yona Yona features the full slate of its beer selection, including seasonal specials, and a menu of food designed to be paired with their brews. It also looks very much like an American-style brewpub, which would make it quite an attraction for expats looking for a piece of home in Tokyo. I went to Yona Yona Beer Kitchen for the first time just after the New Year with a friend. At first, the restaurant staff wanted to seat us at our own table, but I asked whether we could sit at the bar, right in front of the beer taps. This proved to be fortuitous, as we ended up sitting next to Yoho Brewery’s director of marketing, Satoshi Inagaki, who was in town for the New Year. The first thing Inagaki-san helped us with was to figure out which beers to order off of their beer menu. Unfortunately, they were out of the Yona Yona Ale that night, so I ordered a three beer sampler for 1,200 yen that consisted of the Tokyo Black porter, the 2013 Seasonal Amber Ale, and a Belgian-style white beer called Suiyobi no Neko. All of them were great, but I particularly liked the porter which had coffee, chocolate, and roasted malt flavors, and tasted quite light and mild in contrast to its dark color. The Suiyobi no Neko was smooth and had a nice fruity taste to it. I also tried their barley wine, which was served in a goblet-style glass, like the kind used to serve Belgian beer. Generally, the beers at Yona Yona are a little milder in flavor than many of their craft beer counterparts in America, but are nonetheless very tasty and very drinkable. One of my friends commented that he liked how Yoho does not try for extremes like super hoppy, super sweet, or high alcohol content as you often see among many American craft brewers. All of their beers taste well balanced and good. Yona Yona Beer Kitchen also offers “real” versions of their Yona Yona Ale and Tokyo Black porter. “Real ale” (also called cask ale) is unfiltered and unpasteurised beer which is hand pumped without adding extra carbonation. On a subsequent trip that I made to Yona Yona Beer Kitchen a few weeks later, I tried the Yona Yona Real Ale. It tasted a little thicker than the regular ale, and the lack of unnatural carbonation seemed to give it flatter but smoother taste. I enjoyed it. After settling in with our beers, we chatted with Inagaki-san about a wide range of topics including his company, its plans for the restaurant, and his favorite American craft beers (Yoho draws a lot of inspiration from U.S. microbrewers). I also asked Inagaki-san about the challenges to expanding the popularity of craft beer in Japan, and one of the things he highlighted was the conservative tastes that many people still have toward beer. He cited his own father as an example, who said that he found craft beer “too flavorful” — for him and many other Japanese, beer is supposed to be those relatively bland lagers. This is probably similar to the American consumer market prior to the rise of craft breweries over the last 30 years. I wondered out loud whether public perceptions of how well flavorful craft beer would pair with Japanese cuisine factored into this hesitation, and that is when Inagaki-san decided to order the Yona Yona Ramen and share some of it with us. I asked him which beer paired best with the tonkotsu-style ramen, and he told me that most of them went well, including the Tokyo Black Porter. This really surprised me — as you can imagine, most ramen places serve the ubiquitous Japanese lager and my first instinct would have been to select one of Yona Yona’s lighter tasting ales. 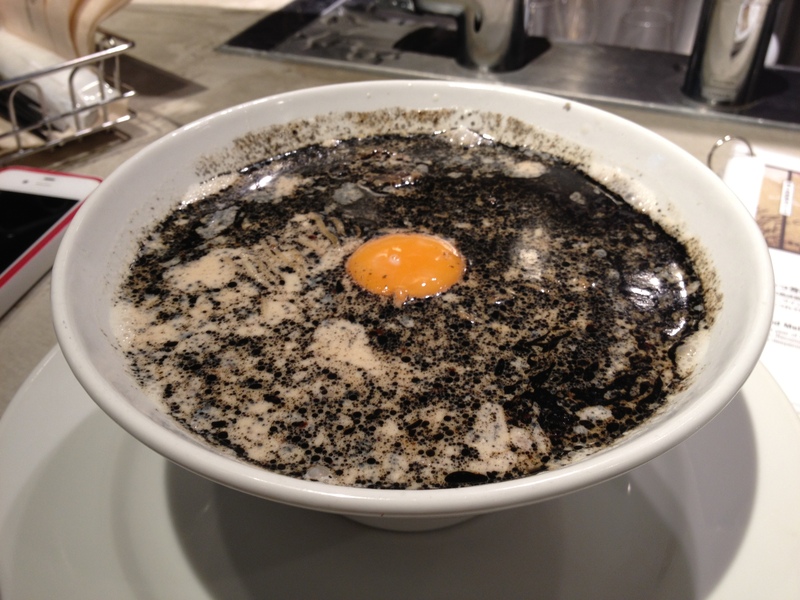 A porter would likely be way too heavy for ramen… or so I thought. And how did the ramen taste? Really good! True to Inagaki-san’s word, the soup had a surprising robust taste that stands up very well next to the deep, rich flavors of their beer — and yes, that includes the Tokyo Black Porter. In fact, I think the flavor of the ramen makes it particularly well matched with the porter. Who knew that I would get a bonus ramen adventure as part of my craft beer expedition? The other items on the food menu were also quite good, as I discovered on the subsequent trip to Yona Yona Beer Kitchen. The french fries were excellent — garlicky but not overly so, and something that you will likely end up ordering multiple time in one trip. One of my companions had the stewed beef, which was tasty but a bit fatty as the Japanese tend to like their meat. Another friend tried the Green and Mushroom Salad, a delicious mix of lettuce, spinach, tomatoes, and crispy slices of fried lotus root topped with sauteed Japanese mushrooms. They also ordered the Bagna Cauda, an assortment of grilled seasonal vegetables served with a ginger sauce and an anchovy sauce on the side. I have also heard rave reviews about the Spicy Chili Dog, while Inagaki-san mentioned that the roast chicken is the most popular dish on the menu. Lastly, I note that the restrooms look really cool. 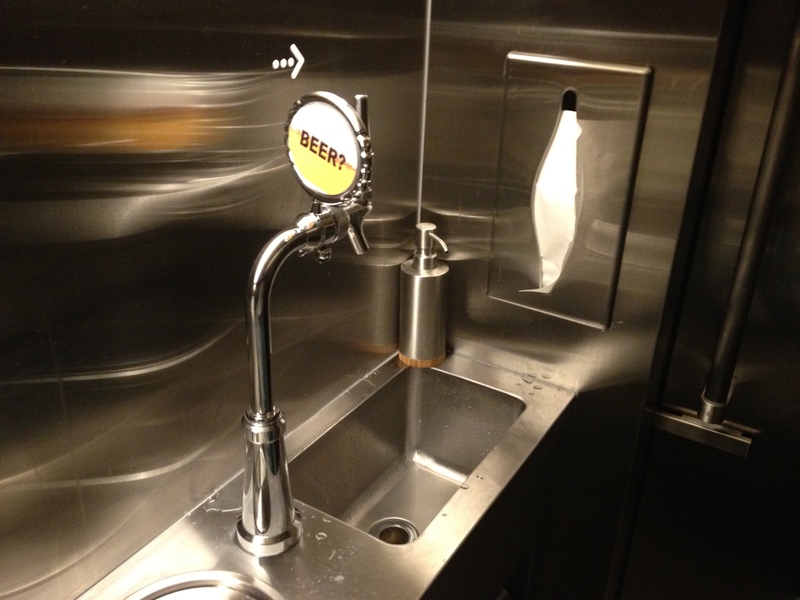 The walls and counters are completely stainless steel, and the faucet is a beer tap. Yona Yona Beer Kitchen is an awesome place to relax, have a good meal, and (of course) enjoy some of Japan’s finest craft beer. I want to especially thank Inagaki-san for his kindness and willingness to chat with me. I hope that he and the Yoho Brewing Company will continue to have success with Yona Yona Beer Kitchen (there were a lot of customers both times I have gone) and that they will open more restaurants in Tokyo and across the country. I also hope that the popularity of craft beer will continue to grow in Japan, especially given the the energetic drinking culture here and the quality of beer being produced by Japanese microbreweries. Japanese craft beer brewers have the chance to change the way Japanese think about beer, in much the same way that their U.S. counterparts have done in America in the last few decades. And I hope other people around the world will have the chance to taste and appreciate their good work too. Business Hours: 11:00am-11:30pm daily. Lunch menu available until 4:00pm on weekdays. Last order: 10:00pm for food, 10:30 for drinks. Getting There: Take Metro (Maranouchi Line) to Akasaka Mitsuke station. This entry was posted in Beer, Drink, Ramen and tagged Akasaka, Asia, Beer, craft beer, Japan, Nagatacho, ramen, Tokyo, Yoho Brewing Company, Yona Yona Beer Kitchen. Bookmark the permalink. This place looks amazing, a definite must-try on my next trip to Tokyo. I’m especially intrigued by that tsukimi ramen, it really does remind me of the moon in a dark sky. Definitely check it out! The tsukimi-style Yona Yona ramen is something that you can only appreciate fully with a delicious pint of craft beer. Enter your email address to follow "No Ramen, No Life" and receive notifications of new posts by email.